At CSPC we are committed to providing the best service to our clients. This means being able to provide the best and most up to date treatment modalities to help our clients get back to their best as quickly as possible. In recognition of this, we have invested in a shockwave machine. It is particularly indicated for chronic Achilles tendinopathy, patella tendinopathy, plantar fasciitis, tennis elbow, and calcific tendinopathy of the shoulder. 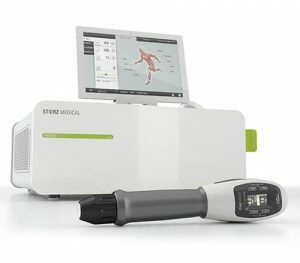 We offer a very comprehensive service of assessment, diagnosis, treatment and rehabilitation plan and having the most technically advanced and successful shockwave therapy system to hand will not only allow our physiotherapists to provide the best hands on treatment but it will also help to bring faster relief to chronic localised issues. If your CSPC physiotherapist believes that a course of shockwave therapy will help your recovery process they will discuss this with you during your consultation. If appropriate, the shockwave therapy treatment can be carried out during your 1 hour physiotherapy consultation, at an additional add on cost or as a separate appointment with a CSPC therapist trained in the application of shockwave therapy treatment. In line with The National Institute for Health and Care Excellence (NICE), the recommended medical treatment is conducted over three sessions at weekly intervals. This allows the radial shockwaves to effectively treat the injury. How many sessions of Shockwave Therapy are needed and how long does it take? On average, three to six sessions are required. You will require a full assessment to determine the number of treatments you will need. How successful is Shockwave Therapy treatment? It depends on the conditions treated. Statistics show over 90 percent of patients experience a reduction in their pain. In patients that suffer from plantar fasciitis and heel pain related problems, pain reduction is remarkable, 39 studies showed a success rate of 94% in Plantar Faciitis. The overall success rates for all indications ranges between 60% to 80% depending on the conditions treated. Can Shockwave Therapy treat old/persistent injuries, or is it only for new problems? It can treat both long term chronic conditions and newer acute injuries, there is a great deal of evidence to show that Shockwave can achieve great results even with historical conditions. Is Shockwave Therapy ESWT painful? You may feel discomfort to begin with, however, the treatment is delivered with a low amount of energy at first, which is increased as your body gets used to it. Your clinician should ask for constant feedback during your treatment and will adjust it accordingly. Shockwave Therapy creates an analgesic effect, many patients report an immediate relief following shockwave therapy from the pain caused by their chronic conditions. Will there be pain after the Shockwave Therapy treatment? Normally patients experience a reduced level of pain in their condition or no pain at all immediately after the treatment, but a mild and diffuse pain may occur a few hours later. This dull pain will subside after a day or so. What if there is pain after the Shockwave Therapy treatment? Shockwave therapy treatment initiates a pro-flammatory response in the tissue that is being treated. If necessary, patients may use ordinary prescription-free pain killers. Do not use anti-inflammatory medication or apply ice on the treated area as both may interfere with the body’s self-healing process. What are the Advantages of Shockwave Therapy ESWT?